​As a young boy I had many mentors: loving parents, good friends, wise teachers. 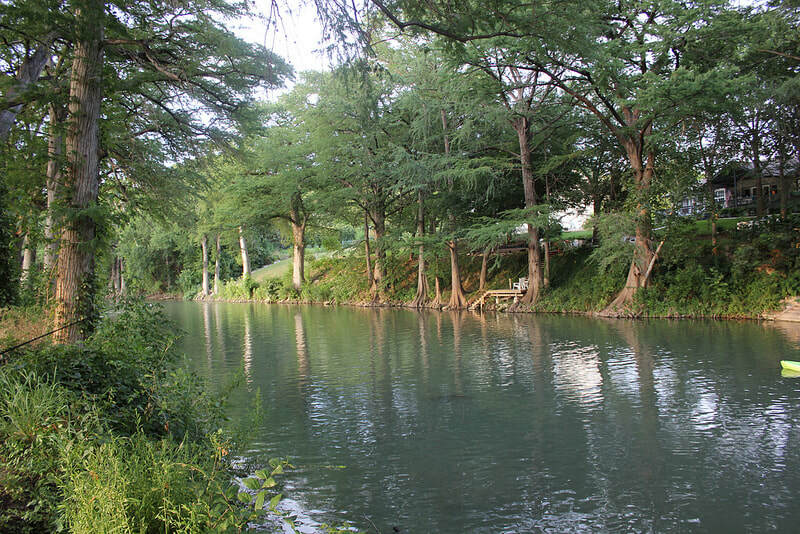 One of the most important was the Guadalupe River in the hill country of Texas. She -- and I cannot help but think of her as a her -- is 87 miles long and flows smoothly most of the time into the Gulf of Mexico. My parents would take me to the Guadalupe River when I was a child, and I was mentored by her color, her smell, and by the way she could hold you if you swam in her. You could never clutch her in your hands, because she was made of liquid. But, like God, you could float in her and be supported. Often I would swim underneath her surface and look up at the world above, where my parents were having a picnic. Intuitively I realized that that the world beneath the surface is as real in its way as the world above. It is a world of beauty, of silence, of darkness, and dreams. It is different from the surface world, but complementary to it. Often when I look into the eyes of people and animals, I see this river. All people have rivers inside of them. All people have depth dimensions, even if they do not know it. Our hearts always contain more than our minds can ever understand. In some ways the Guadalupe River introduced me to Asian religion. A friend jokes that that the Guadalupe River made a Taoist of me. She helped me realize that life is flowing and fluid, and that the purpose of life is not to escape the fluidity, but rather to flow with it and in it, as best you can, and sometimes, if you are really lucky, to be absorbed into its silent beauty. It is from her underwater currents, and also floating on her surface, and I learned to "go with the flow." But she may have made a Buddhist of me, too. I am especially grateful to the Guadalupe River for helping me understand the wisdom of silence, because when you swim under her surface everything is so quiet. All you can do is listen and be amazed. All you can do is allow the preoccupations of your mind to fall away, so that you can listen to what Zen Buddhists call "the sound of one hand clapping," and then realize that in a deep way, that sound is everywhere -- in the sheer activity of being alive -- even in the surface world. Silence is not the absence of sound, it is the present of listening; and the Guadalupe River helped me listen. I was a churchgoer as a young child, and I still am. I know some Christians who might say that God "creates" rivers, as if God is one reality and rivers quite another. But I see things differently. I think God is a feeling, too; and that God can be found inrivers, just as God can be found in music, and in the eyes of other people, and in moments of kindness, and love, and play, and wonder. It was from our Lady of Guadalupe -- much more than the words of the Bible -- that I learned about mystery and beauty and silence, and about how you can swim in beauty without fully understanding it. When I wash my hands, I think of the waters of the Guadalupe. I think Jesus might have had an appreciation for rivers, too. He was baptized in one. Only after surfacing from the grace of the Jordan River did he realize his calling. Does a river have a soul? I am not sure. Maybe not, if by "soul" we mean a particularized seat of awareness, a distinctive vantage point from which the world is seen. The Guadalupe River is more spread out, with many vantage points. And she is changing all the time. In this respect I think she illustrates the teachings of Buddhism. If souls exist, they are flowing and thus different at every moment. We never step in the same river twice, say the Buddhists, and even we ourselves are never the same stepper. The Guadalupe River is a vivid example of the liveliness of impermanence. And yet certainly, amid her flow, she has soul in the African and African-American sense. Soul is depth and feeling, authenticity and beauty. She is filled with this kind of soul and thus immensely soulful. I think she would be much at home with the rhythm and blues, or the soulful explorations of the famous jazz album Kind of Blue. Equally important, in her soulfulness, she has a welcoming spirit. She lets people swim in her; she lets children spash around in her; she let's people sit by her banks underneath the trees and have picnics, or read novels, or watch her currents. Admittedly, sometimes she gets angry and shows a different kind of power. People have drowned in her. But she is generally a very safe and gracious river. A religion with much beauty -- Islam -- says that, in the last analysis, the mercy of the divine mystery takes precedence over the wrath. One time, when I was young, I saw the wrath of the Guadalupe River. She was overpowering. She was flooding, and she elicited in me a feeling of terrifying mystery, which is one way of feeling what scholars of religion call the holy. But I think her mercy is much more prominent than her terror. There is a teaching in Islam which says that the divine mystery has ninety-nine names, one of which is The Beautiful and another of which is The Merciful. I think these two names are the ways that the Guadalupe River reveals God. She is also very independent, and in this respect she reminds me of the Hindu goddess Kali or, perhaps better, the goddess Ganga, whose presence is found in the Ganges River. I suspect that, as a goddess, the Guadalupe River is also a feminist. She does not belong to any of the people who swim in her. She is not male-defined; she is not dependent on the male gaze for her approval. She is her own person. Yes, some people might think they own her, or that they own rights to the banks by her; but really, in her beauty, she owns them. And that's the way they want it, deep down. Nobody really wants to own a river like the Guadalupe. Capitalism can't touch her. They just want to be close to her, and sometimes they confuse this with owning. If we use the language of "belonging," then she belongs to everybody but also to nobody. Here she elicits a sense of divine transcendence. Nobody owns God, either. Not even people who think they do. ​I have said that God can be found in feelings. One such feeling is the sense of grace we humans receive from dogs, with their capacities for unconditional love. I say this because one of my companions in river absorption was a dog. She belonged to me and I belonged to her. There was a mutual belonging. She would swim above water most of the time, but she didn't mind diving into the depths. Her name was Patty. Patty was like the Guadalupe River: beautiful, silent, mysterious, and flowing. Like all living beings, she was not simply a body, she was also a soul. Of course she was not the only soul in the river. As I would swim underneath the waters, I would see the fish: perch, catfish, and minnows. They, too, were ensouled bodies. They, too, moved according to their own aims. There are so many kinds of soul, so many forms of beauty. Some of them are strange and scary: like the snakes, the water moccasins, who would swim in the Guadalupe River. But they, too, are souls. Patty would bark at them and try to get close to them. I would try to swim away from them. Still we were all swimming. This is part of what I mean by soul. I mean goal-directed feeling and activity that follows from it. When Patty would bark at the moccasins and yet get close to them, she was filled with goals. And when I would swim away I was filled with goals, too. The fish would swim away from us, as would the snakes. They had goals as well. But there's more to soulfulness than agency. There's also the capacity to feel the surrounding environment from a first-person or first-canine point of view. Or first-minnow or first-snake point of view, for that matter. To feel the presence of otherness, of what philosophers call alterity. In process philosophy this activity is called concrescence. It is the activity of subjectively prehending or feeling what is around you and gathering it into the unity of a single moment. Soul is not supernatural; it is ultra-natural. When we swim in rivers, when we look at dogs, when we see our parents having picnics, the rivers and dogs and people become part of us. Whitehead says that the ultimate realityof the universe is the many becoming one in each moment of experience, whether human or canine. Every moment of our lives the many are becoming one in us and as us. That's a Zen idea: every moment in life is an incarnation of the whole universe. To see the universe in a grain of sand, said William Blake, is to see heaven. I see heaven in the eyes of a dog and the flow of a river, too. ​A little more about dogs. Many people like to talk in general terms about all animals and how we should respect them. This is noble language. Or if they want to narrow things down a bit, they may talk about the beauty of different kinds of animals, saying that we should protect endangered species. This, too, is noble. But in our rhapsodies about allness we can lose sight of eachness. By eachness I mean the singularity: the unique way that each animal presents itself to the world, staking its ground, and making its claim upon the world. Each human being is a node within the larger web of life but not reducible to any other node. And so it is with each animal. Each animal is a subject, endowed with capacities for feeling, intelligence, memory, anticipation, perception, and aims. This subjectivity is the animal's eachness. In order to approach the eachness of an animal or, for that matter, another human being, it can help to have a sense for rivers. There is an old Zen story that speaks to how might "know" a dog. A monk asked Zen Master Joshu if a dog has the Buddha-Nature and Joshu answered "Mu," which literally means not. This confused the monk, because he knew, as did Joshu, that all living beings have the Buddha-Nature, dogs much included. But Joshu's Mu was a wise saying. He was inviting the monk to let go of all speculative questions concerning animals and the Buddha-Nature, and simply "be" in the present moment. This is the heart of Zen. It is to experience the sacrament of each present moment, whatever the moment happens to be, and to respond with wisdom, compassion, and freedom, as best one can. The Zen way is very river-like. It is free to adjust to each new situation. I remember years ago riding in a car with a friend of mine from Japan who was a Zen priest and who, later, became a Zen Master. I was his English teacher for one year while he was studying in the United States. We saw a dog crossing a lawn just to one side of the car, with a bone in his mouth, strolling toward a place where he would hide it. My friend -- the late Keido Fukushima of Kyoto, Japan -- turned to me quickly and said: "Jay, do you see that dog?" I said "Yes." He said: "That dog is a Zen Master." That made sense to me. Every living being is a Zen Master. Some people just don't know it. ​One time a young friend of mine asked me if dogs go to heaven. His dog had died. I said that they did. He was glad to hear it. He then added that, if they happened to go to another place, he'd want to do to that other place. "Who would want to go to a place without dogs, without rivers, without other forms of life?" He added that a friend of his had said dogs do not have souls. I said that I disagreed with his friend, and that sometimes I thought maybe dogs are so beautiful that they have many souls, maybe even more than people have. He and I agreed that dogs are pretty special. How many souls does an individual dog have? It is hard to say. Our human souls change with each and every experience. Who we are at age thirty-six is different from who we were at age twenty-six, which is different from who we were at sixteen, which is different from who we were at six. Imagine the crest of a wave as it moves toward the shore. The crest is different at every moment, carrying with it a past that accumulates more memory over time. This cumulative past is like karma. But the present is always more than the past, and it is in the present that freedom lies. We can use the phrase "individual soul" to name the wave as a whole (from its beginning until it reaches the shore), or we can use the phrase to name each moment of the crest. If we use it in the latter sense, then we are a series of souls -- a series of concrescing moments -- which inherit from their predecessors with a certain kind of intimacy. The same situation obtains with a dog. Every time a dog barks she is a slightly new dog. A slightly new soul. The dog in the image is a young soul in a certain way; but perhaps also an old soul in another way. Who knows how many previous lifetimes she brings to her journey, this time around. There are lots of old souls inside her, encoded in her genes and in her dreams. Yes, she lives her life one soul at a time. But like the crest of a wave, what lies behind her, and within her, may be very distant and deep. For my part, I feel grateful to the Guadalupe River for teaching me about dogs, and I feel grateful to Patty for teaching me about the Guadalupe River. There's so much beauty to be seen in our world, even in its sadness and tragedy and horror. So much wonder. So much eachness. Some people think the beginning of wisdom lies in a fear of the Lord. But surely it can also begin with delight in beauty. The Lord finds us through the waters of a river in whom we float, the eyes of a dog who swims along with us, and in the wise teachers, the loving family, the good friends, who can mentor us into abundant life, moment by moment. I am a Christian myself, and it's because I believe in sacraments. I think Jesus was a sacrament whose own openness to life, and especially to the poor and powerless of the world, was an invitation for us to appreciate sacraments wherever we find them: in the wisdom of Zen priests, in the wisdom of dog priests, in the wisdom of river priests. There is a movement in Thailand where, in order to protect forests, the farmers ordain trees, declaring them Buddhist priests. No one cuts down a tree if it is a priest. Let's ordain rivers, too. And dogs. Maybe even minnows and snakes. The ordination can be very simple. All we have to do is to recognize that they are our priests -- already our mentors -- if only we have eyes to see, ears to listen, and hearts to love.